In the UK we experience a range of adverse weather conditions that can affect the way we drive and how aware we need to be. Ice and snow aren’t all we have to be careful of; the sun can also be a culprit of accidents on the road. There are a number of precautions you can take to ensure your driving safely at all times. Here we discuss how to prepare yourself for driving in all weather conditions. What weather conditions do I need to be aware of? In the UK most weather conditions we experience can cause some form of hazard on the road. There are some modifications you can make to your car to help, but others are also the responsibility of the driver. So we always recommend planning your journey ahead of time and keep an eye on local weather reports. Last year we witnessed some of the most extreme snow in the UK since 1991, which had a great impact on driving conditions and the safety of road users. Driving came to a halt as drivers were unprepared and snow had settled on the roads. Snow can become a real problem when it comes to the roads here in the UK, our councils will go out and salt the roads to try and avoid the snow settling but it does not always work. In some cases, snow can be very unpredictable, which means no matter how much salt is put out on the road it’s going to block to the roads and cause havoc. Avoid driving if you are tired or feel that you cannot give the road your full attention. 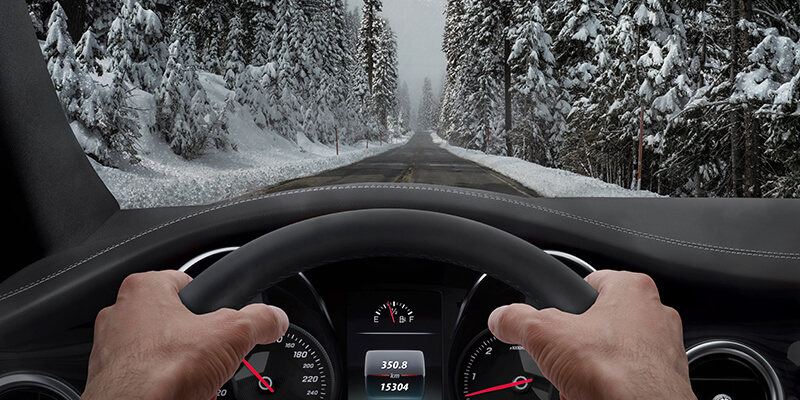 If you are going to drive you should always be able to concentrate and give the road your complete attention, when driving in the snow this could not be any more important, as your senses need to be heightened when driving in the snow, as anything can happen. If you haven’t already driven in the snow, your car can find it very hard to stay in control, you will often find your wheels spin a considerable amount more which means you have to take more care when driving. Before you take your journey, we always recommend ensuring you have a couple of items in the vehicle before you set off. Firstly, always have a spare blanket which you can pick up from The Edinburgh Woolen Mill and spare bottle of water, in case you have an accident or are stuck in traffic for prolonged periods of time. When it comes to driving, you need to drive a lot slower than you usually would as your stopping distance becomes significantly longer. Acceleration and deceleration should be completed slowly; this is to prevent the car from skidding. Always have your foot ready on the brakes, keep the heel of your foot on the floor and apply steady pressure with the ball of your foot on the brake pedal. This will allow you to be in control of the vehicle at all times. We also recommend if you can try your best not to stop, your car may potentially struggle to get going once it has stopped so, you should always try to keep the vehicle rolling at a slow and steady pace. Hills can often be drivers worst nightmares when it comes to snowy or icy roads. If you are going to go up a hill, try to get some momentum going on flat road before going up, also do not go up the hill unless it is clear. The last thing you want to do is have to stop midway up as you will either roll or not have enough momentum to keep going. Make sure to check weather reports before you leave for your journey if it is meant to snow heavily throughout your journey decide whether you really need to take it. If you are going to drive through the snow, make sure you have all of the necessary equipment and essentials to ensure you are warm and have water and food in case you get stuck in the car for long periods of time. Some forms of rain in Britain can be easier to drive in than others. In some cases where we experience torrential rain, we have to be more cautious on the road. We always recommend when driving in strong downpours take your time and don’t be pressured into driving at speed. When it rains heavily a rather large amount of water can collect on the roads. You should always drive slowly, or if you see a huge water puddle slow right down otherwise, your vehicle can start to hydroplane which means your tyre cannot handle the amount of water it has encountered and is unable to push the water away from the tyre. Have your headlights on so other road users are able to see you at all times, even in broad daylight it is safer to have your headlights on than to not. Last but not least, give other vehicles more space than normal, it will not only take you longer to come to a stop, but it allows them to react to traffic without you hitting their vehicle. To make sure your car is prepared in this situation, check your windscreen wipers, over time they do start to deteriorate, which can mean they do not clear the water away as well as they should. If you do need new windscreen wipers we recommend taking a look at WiperBlades.co.uk as they have a wide range available, you can also put your make model and registration number in to find the perfect ones for your vehicle. Wind can be a tricky weather condition to drive in especially when it is speedy. For smaller vehicles, this can be more of a hazard in comparison to larger cars such as 4×4. When driving past larger vehicles be more aware of gusts of wind pushing your vehicle away from the other. Always keep a firm grip on the steering wheel, the wind will start to push your vehicle, so you need to be in control at all times. We also recommend taking more caution on motorways, when travelling at high speeds the effects of strong wind can become greater, so you may want to consider slowing down to ensure you and other road users are safe at all times. Driving when it is sunny isn’t normally a hazard to driving, however, it can affect your visibility depending on what time of day it is or whether it has rained previously. If it has been raining, and it is still evident on the roads, then you may find that with bright sunshine you can often experience a strong glare off the road. Bright and low sun can have a dramatic effect on visibility, even more so if you have dust on the inside of your vehicle. It is important to regularly clean your windscreen both inside and out during spring and summer months. We also recommend always having a pair of sunglasses in your vehicle; sun visors cannot always get the right angle of the sun especially when it is low. Sunglasses with polarised lenses are more effective at reducing the glare, and work well when the roads are wet. You can grab a range of unique sunglasses from Sunglasses Shop. It isn’t always easy to see other road users when the sun is shining brightly; this also goes for other people on the road, they may be struggling to see you, so just be a bit more cautious of where they are on the road. We also recommend avoiding any sudden stops, come to a stop slowly and in a timely manner leaving road users behind you enough time to react. Hot weather can also have an impact on how tired you become when driving, we always recommend ensuring your car is well ventilated during the summer months. In more extreme heats, it has been recorded that the roads here in the UK have started to melt or become soft which can have a drastic effect on driving conditions such as steering and breaking. In the UK we experience a vast number of foggy mornings, which can cause a number of hazards if people do not take extra care. Unfortunately, it tends to happen during rush hour which seems to be when most people are rushing to get somewhere and are often selfish when it comes to driving. However, when it comes to a foggy morning there should be a number of things you do, to not only make sure you are safe but so are others on the road. Fog lights need to be used when it becomes foggy, but you need to know when it is the right time to turn them on. Using them at the right time should aid your visibility, however, if you have them on at the incorrect time you could actually be breaking the law. Before entering fog, you should always check your mirrors and slow down. Make sure you leave a greater distance between you and the car in front, as it gives you more time to brake, sometimes it can be a little tricky to see the lights on the car in front of you so by giving extra time you’re ensuring no accidents will occur. It is always recommended you turn your fog lights on when you can no longer see up to 100 metres in front of you. You should never turn your full beam lights on, as fog reflects light, so you will only be reducing the visibility of other road users. If you have been driving in the fog without your fog lights on and have an accident, you could invalidate your insurance which means you were not covered for the accident. So make sure before setting off on your journey you know exactly where your fog lights are. Here in the UK, we have to learn to drive in a range of weather conditions which can sometimes be challenging. Make sure you know the local weather before heading off on your journey. If you are going on longer journeys, we always recommend checking your oil and petrol before setting off. The Deutsch Tech team have experienced a number of accidents that have been caused due to weather conditions, if you do experience any damages that need repairing visit BMW repair in Milton Keynes or Porsche Repairs in Aylesbury. If you want to know more about the highway code rules for driving in adverse weather conditions we recommend taking a look at Gov.uk.. It covers driving in wet weather, icy and snowy weather, windy weather, fog and hot weather.